This is one of the best theme frameworks for WordPress from the whole internet. It has multiple controls and advanced interface generator. Turn key solution intended for professional web developers that dont want to mess with too much code. Also the seo capabilities of this framework are very enhanced. The SiteMile theme framework for WordPress is an advanced framework through which you can build fabulous great other themes with minimum programming knowledge. The framework also comes with a great admin side from where you can control font sizes and colors, post title size, post images, picture galleries and many more. 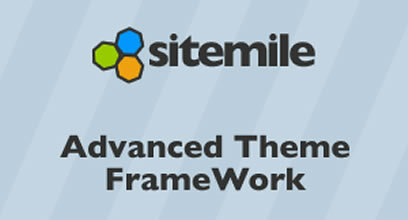 For a more detailed overview of the sitemile framework theme please read below and look at the videos. There is also a big knowledge base of the framework and detailed documentation on how to use it or how to create child themes. The framework is supplied FREE with any child theme that we sell. In order to run the child theme you need the framework installed.